IT has taken 36 years but a Time Lord has finally made a real journey through time. 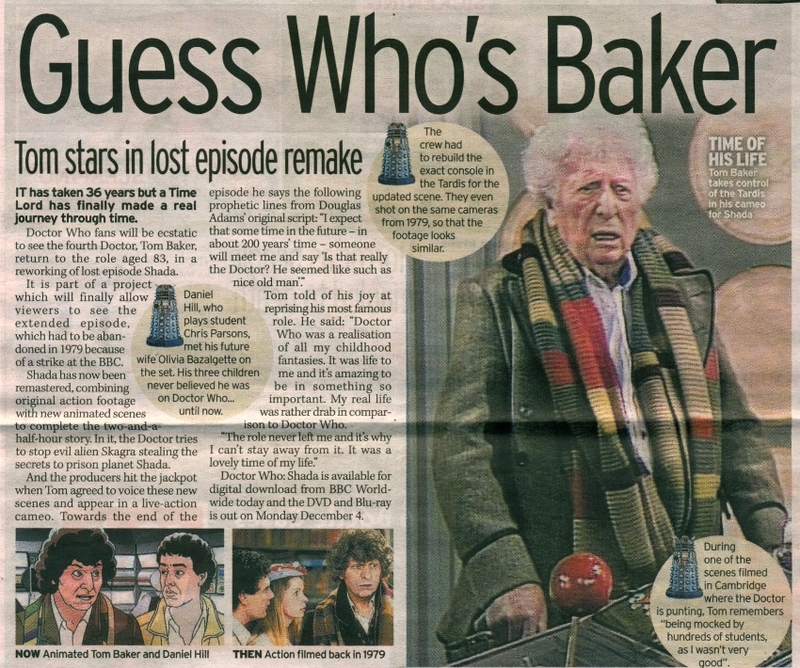 Doctor Who fans will be ecstatic to see the fourth Doctor, Tom Baker, return to the role aged 83, in a reworking of lost episode Shada. It is part of a project - which will finally allow viewers to see the extended episode, which had to be abandoned in 1979 because	of a strike at the BBC. Shada has now been remastered, combining original action footage with new animated scenes to complete the two-and-half hour story. In it, the Doctor tries to stop evil alien Skagra stealing the secrets to prison planet Shada. And the producers hit the jackpot when Tom agreed to voice these new scenes and appear in a live-action cameo. Towards the end of the episode he says the following prophetic lines from Douglas Adams' original script: "I expect that some time in the future - in about 200 years' time - someone will meet me and say 'Is that really the Doctor? He seemed like such as nice old man'"
Tom told of his joy at reprising his most famous role. He said: "Doctor Who was a realisation of all my childhood antasies. It was life to me and it's amazing to be in something so important. My real life was rather drab in comparison to Doctor Who. "The role never left me and it's why I can't stay away from it. It was a lovely time of my life." Doctor Who: Shada is available for digital download from BBC Worldwide today and the DVD and Blu-ray is out on Monday December 4. During one of the scenes filmed in Cambridge where the Doctor is punting, Tom remembers "being mocked by hundreds of students, as I wasn't very good". Daniel Hill, who plays student Chris Parsons, met his future wife Olivia Bazalgette on the set. His three children never believed he was on Doctor Who ... until now. TIME OF HIS LIFE Tom Baker takes control of the Tardis in his cameo for Shada. APA 6th ed. : Jefferies, Nicola Methven, Mark (2017-11-24). Guess Who's Baker. The Mirror p. 22. MLA 7th ed. : Jefferies, Nicola Methven, Mark. "Guess Who's Baker." The Mirror [add city] 2017-11-24, 22. Print. Turabian: Jefferies, Nicola Methven, Mark. "Guess Who's Baker." The Mirror, 2017-11-24, section, 22 edition. This page was last modified on 1 April 2019, at 23:06.